CB Rashean Mathis has a torn ACL in his knee, Tania Ganguli of the Florida Times-Union reports. Mathis’ injury was of the non-contact variety during the second quarter of Sunday’s 17-3 win over the Colts. Mathis underwent an MRI on Monday and will be placed on injured reserve. 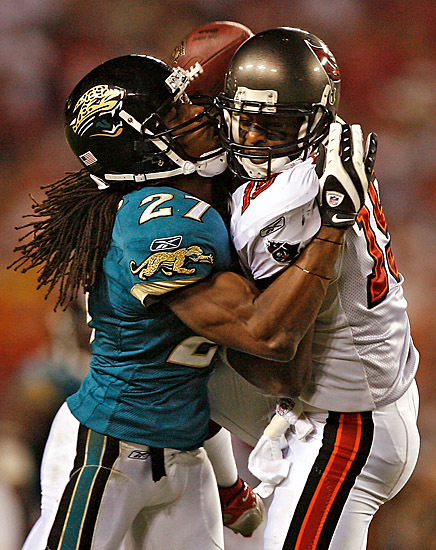 A 2003 second-round pick out of Bethune-Cookman, Mathis has 498 tackles, one quarterback sack and 30 interceptions during his nine-year career, which included a trip to the Pro Bowl after the 2006 season. Since 2006, Mathis has played in all 16 games in just one season (2006), finishing the 2008 season on injured reserve with a knee injury. Mathis, 31, is in the final year of his contract and was set to be an unrestricted free agent after the season. William Middleton and Drew Coleman are behind Mathis on the depth chart.